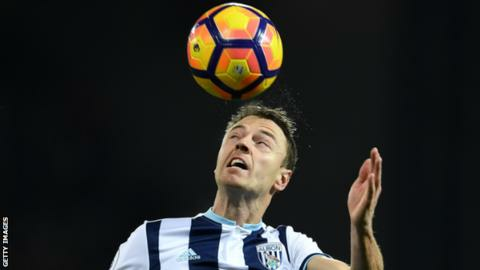 Manchester City have ended their interest in West Brom defender Jonny Evans. City had two bids rejected by the Baggies including one for £18m, earlier this month. They were intending to go back with another offer on transfer deadline day, but could not sell defender Eliaquim Mangala to Crystal Palace. Palace were believed to be keen on the Frenchman, but are on the verge of signing Liverpool's Mamadou Sakho. West Brom also turned down offers of about £25m from both Leicester and Arsenal on Wednesday for Evans. The 29-year-old was absent from West Brom's squad for Sunday's 1-1 Premier League draw with Stoke City. He has joined up with the Northern Ireland squad in Manchester before Friday's World Cup qualifier against San Marino.